Electrical signals control the beating of your heart. They tell your heart muscle when to contract, a process known as conduction. The normal timing of heartbeats is generated in the upper chamber of the heart (atria) in a structure called the sinus node. The signal moves from the sinus node to the pumping chambers (ventricles) of the heart to cause a heartbeat (contraction). When you have heart block, there is interference with the electrical signals that usually move from the atria to the ventricles. . This is known as a conduction disorder. If the electrical signals can’t move from your atria to your ventricles, they can’t tell your ventricles to contract and pump blood correctly. First-degree heart block is the least severe. The electrical signals slow down as they move from your atria to your ventricles. You may not need any treatment for first-degree heart block. Mobitz type I: The electrical signals get slower and slower between beats. Eventually your heart drops a beat. Mobitz type II: The electrical signals sometimes get to the ventricles, and sometimes they don't. There is no progressive slowing of the electrical signal. This type of heart block can often progress to third-degree heart block. Third-degree heart block is the most severe. Electrical signals don't go from your atria to your ventricles at all with this type. There is a complete failure of electrical conduction. This can result in no pulse or a very slow pulse if a back up heart rate is present. If you are born with heart block, it's called congenital heart block. It is caused by a condition your mother had during her pregnancy or heart problems you were born with. For most, heart block develops as you get older. It happens as the wires (nerve fibers) that connect the top and bottom of the heart develop fibrosis and eventually fail. Sometimes this may happen because of advancing age. Any process that can damage these heart wires can result in heart block. Coronary artery disease with and without a heart attack is one of the most common causes of heart block. Diseases that weaken the heart muscle (cardiomyopathies) can also damage the wire. Heart block can also be caused by any disease that can affect the heart such as sarcoidosis and certain cancers, or any disease that results in heart inflammation. This can be an autoimmune disease or infections. Electrolyte problems such as high potassium levels can also result in heart block. Who is at risk for heart block? Symptoms depend on the type of heart block you have: First-degree heart block may have no bothersome symptoms. How is heart block diagnosed? 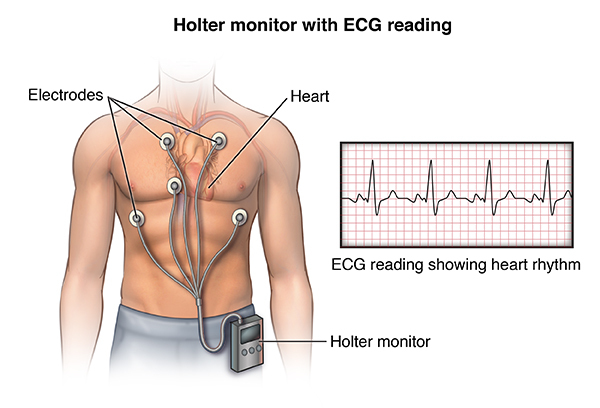 Testing with a Holter or event monitor to track your heart’s rhythm for a period of time. You might wear a Holter monitor for 24 or 48 hours, or an event monitor for a month or more. These help capture changes in your heart’s rhythm, even if they don't occur often or predictably. Implantable loop recorder. This is a small heart recorder that is placed under the skin over the heart. It can record up to 3 years. An electrophysiology study. This is an outpatient procedure in which thin, flexible wires are threaded from your groin or arm to your heart to test the heart's wiring system. How is heart block treated? With first-degree heart block, you might not need treatment. With second-degree heart block, you may need a pacemaker if symptoms are present or if Mobitz II heart block is seen. With third-degree heart block, you will most likely need a pacemaker. Your medical team may also make changes in any medicines you're taking or treat any related underlying condition. What are the possible complications of heart block? Complications of heart block may include fainting with injury, low blood pressure, damage to other internal organs, and cardiac arrest. Can heart block be prevented? Pregnant women who have an autoimmune disease may be able to get certain treatment to reduce the risk for heart block in their babies. Prevention of heart block focuses mainly on managing the risk factors. A healthy lifestyle helps overall good health, including heart health. Exercise, eat a well-balanced diet, and don’t smoke. Understanding the risks of your medicines and reviewing them with your healthcare provider can reduce the risk for medicine-induced heart block. Talk with your healthcare team before taking any herbal supplements or new medicines, especially if you have risk factors for heart block. Follow your healthcare provider’s recommendations for taking medicine and using a pacemaker, if that applies to you. Also always keep follow-up appointments to make sure your treatment is on track. Stay out of situations in which your pacemaker may be disrupted. This includes being near an electrical device or devices with strong magnetic fields. Carry a card that lets people know what kind of pacemaker you have. 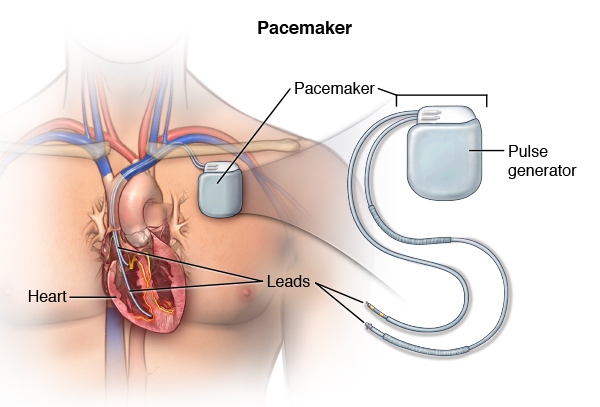 Tell all of your healthcare providers that you have a pacemaker. Stay active, but don't take part in contact sports. Wear a medical alert bracelet or necklace. If you have sudden cardiac arrest, you won't be able to seek care for yourself. It is very important to make sure the people you see on a regular basis know what to do in an emergency. Calling 911 is the most important first step. Heart block occurs when the electrical signals from the top chambers of your heart don’t conduct correctly to the bottom chambers of your heart. There are 3 types of heart block. First-degree heart block may cause few problems. Third-degree heart block can be life threatening. Depending on your degree of heart block, you may not need treatment. For some, a pacemaker is advised.